Girls Can Be Zombies Too! Not all girls want to dress up as ladybugs, butterflies or princesses, it appears as though ‘sugar and spice’ doesn’t always apply and some girls would rather be monsters, rock stars or even Batman for Halloween or any other fancy dress event! This leads to this amazing compilation of cool zombie costumes for girls. Luckily if they hanker after the gorey side when it comes to costumes there are lots of different zombie outfits that they might enjoy. To be honest I think my daughter loves the idea of dressing as a zombie because of the cool make-up more than the actual outfits! 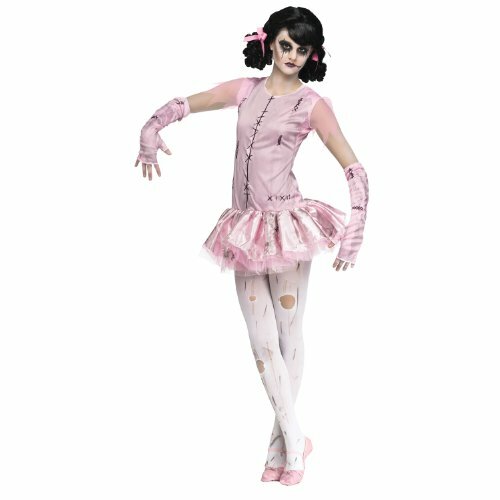 Some girls can alternate between tomboy and ‘girly girl’ and if that’s the case then you could try this featured costume for them – the doll can embrace their inner girly girl while the zombie part can embrace their rock chick, monster loving tomboy side! 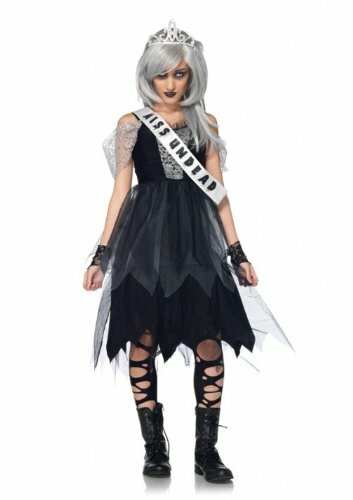 If your little girl loves the Gothic touch then she might like this prom queen costume, she can choose to have a more glamorous Gothic style make up with dark eyes and black or red lipstick or she can add more of the gore factor by having more zombie features and a few decaying wounds on her face and/or arms. The costume includes the dress, sash and fingerless lace gloves – the gloves will probably get quite a bit of post costume wearing as well as they never seem to go totally out of fashion! The wig looks good in this picture, but is un-necessary as you can get temporary hair dye designed to add a zombie effect to your hair. If you do decide to get a wig and it’s a cheap one you can actually get small sections of the hair and put it under a blow dryer – the wig will melt some of the hairs together to give it that clumpy, unkempt look that zombies are known for. Not As Graceful as Human Ballerinas! You could let your daughter wear this costume and still tell everyone at work (or your in-laws) that your daughter’s dressing as a ballerina this year. You’re not lying and they won’t even think that you mean a zombie ballerina, after all has anyone seen a zombie try to dance let alone attempt Swan Lake! 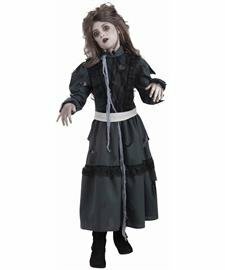 This costume harks back to earlier times – a little girl from the Edwardian or Victorian era, was she a maid or one of the daughters of the house and how did she become part of the undead – so many questions! 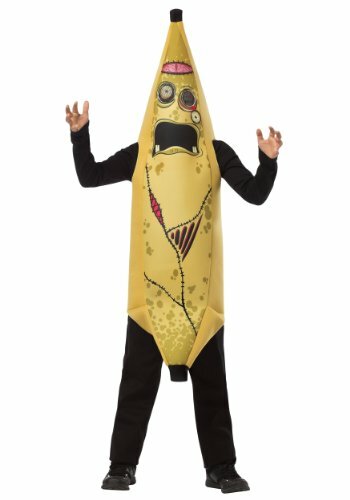 Both girls and boys can dress in this fun costume – just how do bananas become zombies? I don’t think anyone can answer that, but no one can deny it’s not an awesome looking costume. The costume is made of polyfoam and you will have to make sure they wear a skivvy/t-shirt and leggings/trousers under it, but this is definitely a showstopper as far as children’s costumes go! This entry was posted in Children's Costumes, Costumes and tagged zombie costume ideas by Lou. Bookmark the permalink.